Whether you are a technician, research assistant, or just looking to bolster your lab equipment for independent lab use, lab centrifuges will be vital. Centrifuges work by applying centrifugal force to various tubes inside the machine. This separates fluids, gas or liquids outward based on its density as it spins. This is a very useful function for harvesting cells, viruses, proteins, DNA/RNA research and other fluids. Benchtop centrifuges are excellent for most lab applications. They are not as powerful as the larger floor standing versions, but they come at a much cheaper price point. The most important to consider is the relative centrifugal force (RCF). Typically, the higher the RCF, the more efficient it will be a separation. Speed is also measured in terms of revolutions per minute (RPM), and variable speed options are good to have. Another important factor is cooling and noise. Excessive noise can be very distracting if you have to frequently use it. Decent ventilation or internal cooling systems ensure that your samples are not heating up as they spin. This model is fairly compact and versatile, ensuring efficient results every time. It can spin up to eight 15 mL test tubes, or 7 mL test tubes using the small tube sleeve insert. You can set the variable-speed centrifuge between 550 and 3300 rpm, which can produce an RCF of up to 1350 x g. To prolong the centrifuge life, it features a brushless motor that will automatically stop if the unit is opened during operation, and there is a vortex ventilation system in place to protect your samples inside the chamber. There is an easy-to-read digital display with touch controls to change the time, speed, and on/off. For any small or moderate-sized task, this centrifuge is sturdy enough to handle them all. This centrifuge features variable-speed configurations that range from 1000 to 4000 rpm. 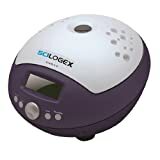 Bench-top centrifuge has a max RCF of 1790 x g. It has a 1 to 60-minute timer with a hold function, and for extra convenience, there is a memory function that remembers that last operation settings. It features a six-place rotor for 10mL or 15mL tubes. This unit weighs just 13 lbs and it uses 80 watts of power. 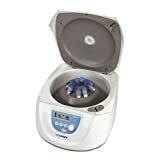 If you’re looking for a versatile centrifuge that can accommodate any task, this non-refrigerated model is effective. It has a variable speed between 300 and 4500 rpm, which can create a maximum relative centrifugal force of 2490 x g. The brushless motor is guaranteed to have a long life and high performance. You can set the timer anywhere between 30 seconds and 99 minutes, making it more versatile than most other brands. This unit features an 8-place fixed angle rotor for 15 mL tubes, and 12 adapters for 10, 7, and 5 mL vacuum-tubes. It also comes with 12 adapter plugs. If you’re looking for a benchtop centrifuge model with a larger capacity, look no further than this unit. It has a speed range for 100 to 3500 rpm and a max RCF of 2300 x g. The timer is settable between 1 and 99 minutes. 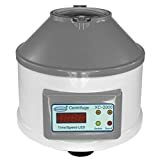 This non-refrigerated centrifuge is slightly larger than most other benchtop models at 10 kg, but it does have a more impressive capacity. It can accept up to six 50 mL tubes. In addition to that, it is compatible with various swing-out rotors and adapters for different sized tubes, which can be purchased separately. If you’re interested in leveraging centrifugal force in a slightly different application in your kitchen, check out this milk separator by Motorsich. This machine makes processing whole milk much simpler. It can be used to prepare any dairy product using the same physics principles as centrifuges. The spinning motion helps separate the fat from the milk, due to the density difference between the two. This separator features a manual driving gear that is easy to use and works effectively. 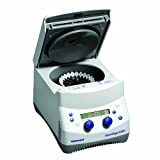 With its dual-rotors and six adapters, this lab centrifuge is an affordable piece of equipment for any smaller task. It has up to 6600 rpm for spinning down micro-sized samples. It comes with two interchangeable rotors: one for 6 x 1.5/2.0 mL tubes, and another for PCR strip tubes. The clear lid makes it easy for observation of samples and if it’s opened it will automatically turn off for safety. This modern centrifuge combines high-performance with a stylish exterior aesthetic. It has speeds between 200 and 15000 rpm, which amounts to a maximum RCF of 15100 x g. You can set the timer to between 30 seconds to 99 minutes, or just have the continuous operation. The brushless motor drive is surprisingly quiet during operation. With its large LCD display and intuitive buttons, reading and setting the options is simple. If you’re looking for a high-end benchtop model, this lab centrifuge will not disappoint. Even though it is compact at 8.9″ x 9.3″ x 12.6″ (H x W x L), it has a very fast motor with speeds up to 15000 rpm. It has an RCF of over 21000 x g, which makes it one of the most efficient benchtop centrifuges on the market. The rotor can hold up to 24 1.5/2.0 mL tubes. It comes with various convenient features such as short spin speed setting, braking, and an adjustable volume alarm. Don’t be fooled by this centrifuge’s small appearance, as it packs quite a punch. It weighs only 5 lbs and measures 130 x 150 x 170 mm. However it has a whopping fixed speed of 10000 rpm, that amounts to a maximum RCF of 5000 x g. It comes with 2 rotor options: 6-places for 1.5, 0.5, or 1.2 mL tubes, and 16-place for 0.2 mL tubes. It will automatically stop if the lid is opened for increased safety, and it accepts 100-240VAC, 50/60Hz power. 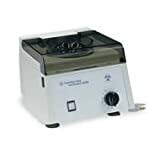 Perfect for small labs, offices or educational institutions, this basic centrifuge has all the features you need. This clinical centrifuge comes with a transparent cover that offers aerosol and splashes protection. It also lets you inspect the tubes as they spin. The centrifuge can be set to up to a 60-minute timer for timed spins, and the motor is built for consistent speed, longevity and reliability. It has a maximum rpm of 3400 and can hold up to six 15 mL tubes at a fixed angle.